Venue, Accommodation & How to get to Singapore. Try www.skyscanner.com to get the best prices. 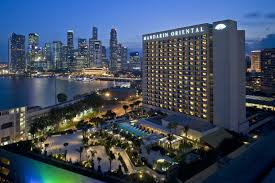 How to get to Mandarin Oriental – Marina Bay Sands. By Train (MRT) – The train station is accessible by foot from Terminal 2 or Terminal 3. To get to the city, transfer to the westbound train at Tanah Merah station. The last train Changi Airport station at 11.18pm. All the trains and gantries at the stations are luggage-friendly. Please have loose change or smaller notes than 10 in denomination as the ticket machines don't accept it. There are 2 types of ticket: Standard Ticket and EZLink Card. The Standard Ticket is a contact less smart card for both single and return trips. You can buy (cash only) the ticket at the General Ticket Machines at the MRT stations. Tickets can be used for up to 6 times within 30 days from the date of purchase. The purchase price includes a 10 cents deposit and this is automatically refunded on the travel fare of the third trip. There’s also a10 cents discount on the 6th trip. The EZLink card is a stored value card that allows for repeat travel on buses, MRT and LRT depending on the amount of money on the card. EZLink cards are sold at TransitLink Ticket Offices, 7-Eleven and SingPost outlets at S$12, S$10 and S$5 respectively with S$5 being the non-refundable card cost and the balance amount the stored travel credit. Bus – Changi Airport Passengers Terminal Building (PTB) Bus Terminals bus terminal located at the basement of each of Singapore Changi Airport's terminals (1, 2 and 3). PTB2 and PTB3 are connected to the Changi Airport MRT Station. In Singapore, bus services do not stop for extended periods, due to the lack of bus parking facilities. Buses terminating at Changi Airport first make a quick stop at PTB3 terminal, before proceeding to PTB1 and PTB2. Take public bus service 36/36A to the city. The first bus arrives at around 6.00am and the last leaves just before midnight. A single fare costs below $2.50 and the ride takes about an hour. Bus stops are located at the basement bus bays of Terminals 1, 2 and 3. Please prepare the exact fare as no change will be given. Alternatively, a stored-value EZ-Link card for multiple rides can be purchased from any Changi Recommends store or the Changi Airport train station. Hotel Shuttle – There are two types of shuttles available at the airport. A hotel shuttle as well as free shuttle service. Free shuttle service - open to all members of the public visiting the airport on a first-come-first-served basis. This service runs from Mon-Fri, excluding public holidays. Please download the timetable for more detailed bus timings. Please note that the bus luggage compartment is not available for use on the Free Shuttle Bus Service. have managed to secure a few rooms at both hotels. Due to the extremely busy period (most hotels are sold out already) these are subject to first come first served upon receipt of payment. The rates we have been able to secure is at a corporate rate.